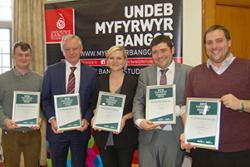 L-R: Rhys Taylor (President, Bangor SU); Prof John G Hughes (Vice-Chancellor); Beth Button (President, NUS Wales); Steve Coole (Director NUS Wales); Rhys Dart (Director Bangor SU)The tremendous work of Bangor Students’ Union was recognised at the NUS Wales Awards recently, where they were short-listed in six of the eight categories and won four of the awards, retaining the ‘Students’ Union of the Year’ title in the process. Bangor Students’ Union won the Students’ Union of the Year award in recognition of their wide-ranging work during the year in areas such as academic representation, student activities and inclusivity. NUS particularly commended their work on community engagement and organising, referencing the 'Love Bangor Community Partnership' as an example of the Students' Union's commitment to ensuring that students are active members of their local community, and not just 'academic tourists'. The Diversity award was given in recognition of the SU’s work, in partnership with some of their student groups, have done on LGBTQ+ issues and efforts made to ensure that their activities and services appeal to, and reflect the diversity of their membership. This campaign was further expanded during the 2015 Sports Varsity event, where all competing teams wore rainbow laces to illustrate that sport at Bangor is a welcoming environment for LGBTQ+ students. They were given the Student Opportunities award in recognition of the success of the 'Summer Sessions' project which provides a route into mainstream activities and involvement for post-graduate and international students. The SU also won the Education award for their work on course reps scheme, their annual student statement, which has been picked up by the Quality Assurance Agency as an example of national best practice, and for course rep involvement in School internal quality audits. Additionally, Danielle Barnard was runner-up in the SU staff member of the Year category for her innovative and dedicated work on academic representation. The SU were also highly commended in the Campaigns category for the work undertaken in partnership with the University’s Postgraduate Society. Professor John G Hughes, Vice-Chancellor, said: "The success of the Students’ Union in winning these awards reflect the hard work they do on behalf of the University’s students throughout the year, and we are very pleased to see this work recognised at a national level. “We’re extremely proud of our achievements as a student body and as an organisation. We are very pleased to have won these national awards. These are in addition to being recognised by HEFCW and the QAA for our work in academic representation over the last two years for innovative sector leading work. “Our focus in recent years has been on opening up our services to students, academic representation led by students, and improving access to extracurricular activities to allow students to shape and enhance their own student experiences. Winning these awards is a testament to the work of the Students’ Union and the students involved in activity right across the organisation.